There is very specific protocol which must be followed to achieve an accurate diagnosis and in all cases, clients should be receiving advice from a dietitian (NHS or private) after a diagnosis is made. A dietitian can help advise people on which foods are most likely contributing to their symptoms and can make sure their diet provides enough nutrients without being excessively restricted. People with IBS often tell me that certain foods make their belly swell up like they are pregnant and/or they experience severe abdominal pain. There isn’t one specific test to determine if you have IBS. 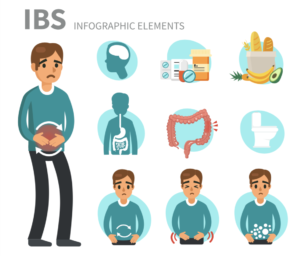 IBS symptoms can be very similar to symptoms of other conditions (like coeliac disease, Crohns, Colitis and cancer) so you must make sure these other conditions have been ruled out. Full blood count – this tells us if your iron levels are low (eg. Low Haemoglobin). Coeliac antibodies (sometimes called TTG or EMA) – this tells us whether or not you have coeliac disease. Do NOT cut gluten out of your diet until this test has been done! I cannot emphasise this enough. Erythrocyte sedimentation rate (ESR) – this also tells us how much inflammation there is in your body. What can a dietitian do? If the advice from Step 1 did not relieve your symptoms, then we will try you on a low FODMAP diet. This restricts almost every type of natural and added starch/sugar which could potentially be causing your symptoms. You will be asked to restrict specific grain products, milk products, vegetables, fruit, legumes, onions and garlic. This is a tricky diet to follow because to the untrained eye, there doesn’t appear to be much rhyme nor reason to which foods are allowed and which ones need to be avoided. Most importantly, a dietitian can help you come up with ideas of what you CAN eat when following this diet. Do not follow low FODMAP advice from the internet! The research into this diet is constantly evolving and advice changes slightly from year to year. You are not meant to follow this diet forever. The idea is to follow the diet to see if your symptoms get better and then add back specific foods one by one to test and see exactly what you are reacting to. If the advice from Steps 1 & 2 did not relieve your symptoms, then it is possible that you have a food allergy, intolerance or sensitivity causing your symptoms. An elimination diet will be recommended which removes all foods which are most likely to be causing an allergic reaction. You will then add foods back one by one to see exactly what you are reacting to. As you can see, managing IBS can be tricky. A registered dietitian can help you navigate what to do, how to do it and in what order to try different strategies. If you want help managing your IBS, please get in touch at: info@eatgreatfeelgreat.co.uk.